dTective is powered by Avid, one of the most comprehensive video editing tools on the market. Avid puts the power of the broadcast industry into the hands of police. The analyst simply drops the video evidence into the timeline. It can then be examined with powerful tools including dozens of video and audio filters and audio enhancements. Video evidence can also be annotated with title overlays. 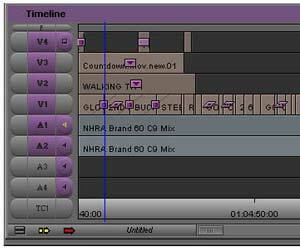 The Avid timeline contains up to 24 video and audio tracks, giving you unparalleled flexibility. When video and audio surveillance tapes are recorded on separate machines, those sources can be easily aligned or synced in the Avid timeline. Multiple video tracks allow the investigator to layer multiple camera angles of a crime scene for more accurate analysis of the chronological sequence of events captured on video. The Avid timeline is the same across all Avid products. Over 90% of your favorite movies and TV shows have been edited using the same tools. More information on the comprehensive video production capabilities of Avid can be seen here.